The top classification is (junmai) daiginjo. Exceptionally refined taste; light, fruity and delicious cold. Find out more in our Junmai Daiginjo and Daiginjo blog guide. The second classification is (junmai) ginjo. Not as refined as daiginjo but still, generally, light, fruity and great cold. Find out more in our Junmai Ginjo and Ginjo guide. 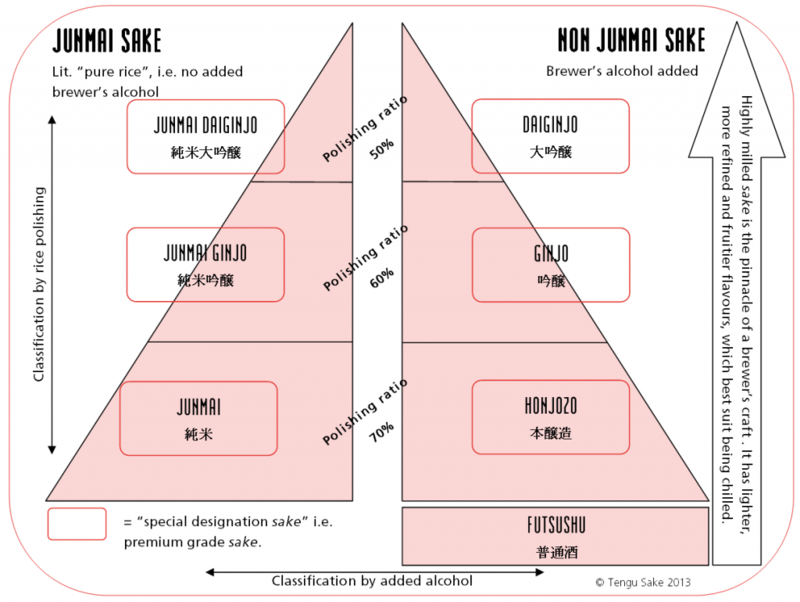 The third classification of premium sake is junmai and honjozo. Emphasis is on bringing out the flavours of the rice; great with food and can be drunk at a variety of temperatures. Find out more in our Junmai & Honjozo guide. Futsushu accounts for 75% of all the sake produced in Japan and is often overshadowed by its premium brothers and therefore overlooked in the West; however good futsushu is fabulous, reasonably priced and versatile. Find out more in our Futsushu guide. There are other styles of sake which require some explanation – nigori, sparkling aged & flavoured sakes, for example. You can find an explanation of other styles of sake on this blog post.